I cannot praise Analog Devices enough for the ingenious designs, and for providing parts like the ADF41020, a fully integrated 18 GHz PLL. This is actually part of a major design effort for a multi-channel frontend, here just a description of the small test board used to establish the general circuit layout and board design. 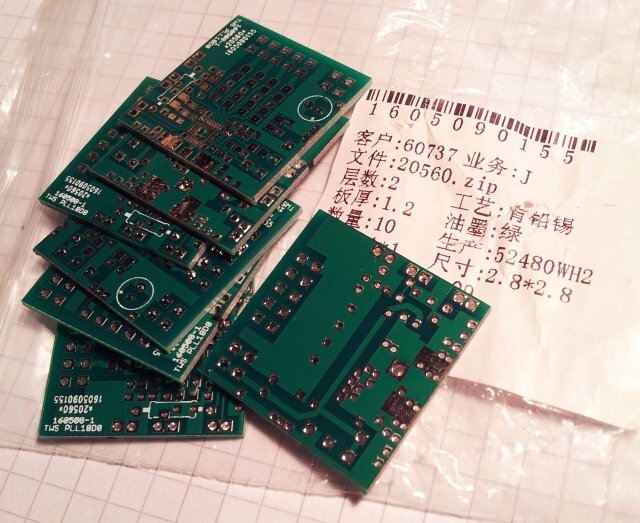 Probably interesting is also the hand-soldering of the LFCSP leadframe package, which is actually not as difficult as it seems. 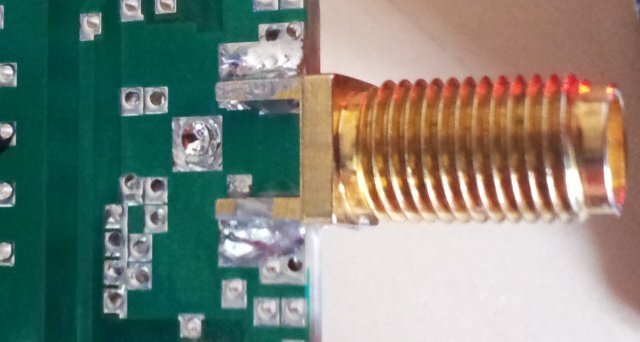 For soldering of the pad, there is a large via in the center, which does provide good heat-sinking and is easy to solder through the 1.2 mm board. 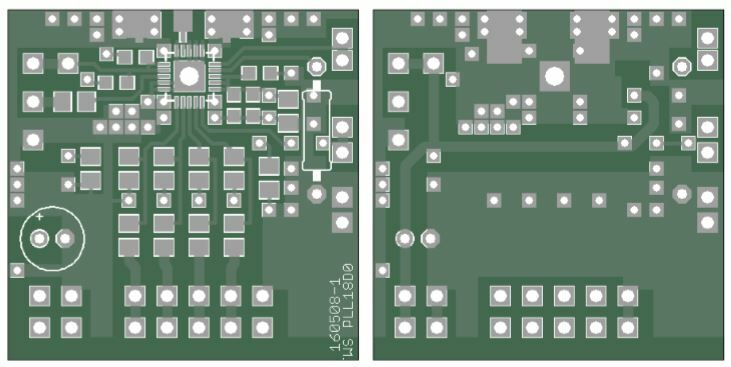 Above, the layout, below, 10 boards – 14 dollars and a few weeks later. For soldering, best use 0.5 mm Ag-containing SMD solder, with Type 32 flux, which is halogen free resin flux. To mount the LFCSP, first apply some solder to the chip pads, but not to the center/heat sink pad. 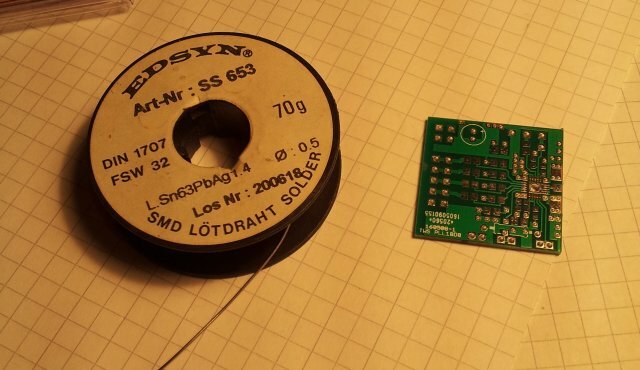 Apply some flux to the board (which is already pre-tinned; use any good SMD flux pen). Then align with a good magnifier, using some Kapton tape to hold the chip in place – leave one side exposed. Then solder, in one stroke, using a medium hot soldering tip. Reflow another time – one side done. Remove the Kapton tape, and solder the remaining 3 sides. 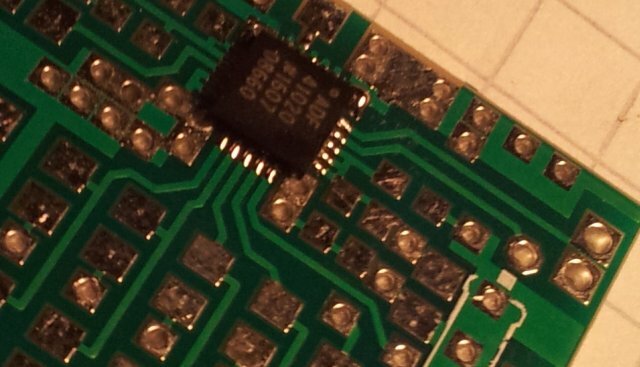 Then stick down the chip with Kapton tape again (to avoid any remote chance of movement, in case all the solder melts during the next step). 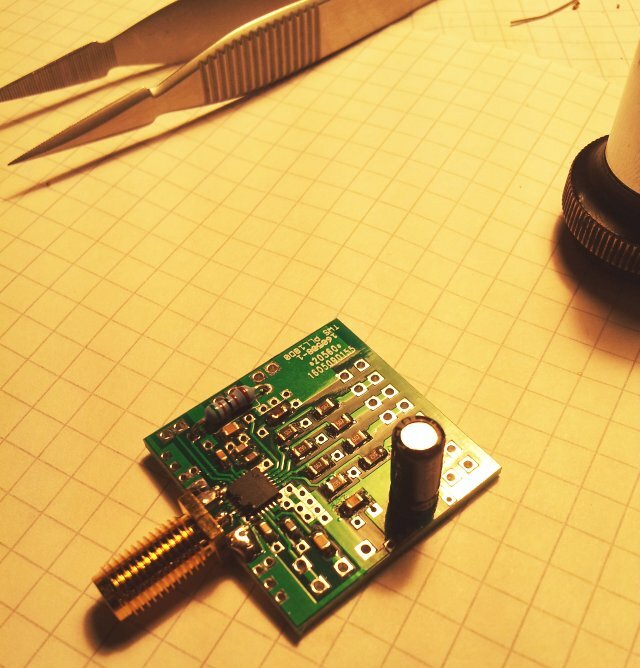 Turn around the boards, and solder through the via, with a fine solder tip. 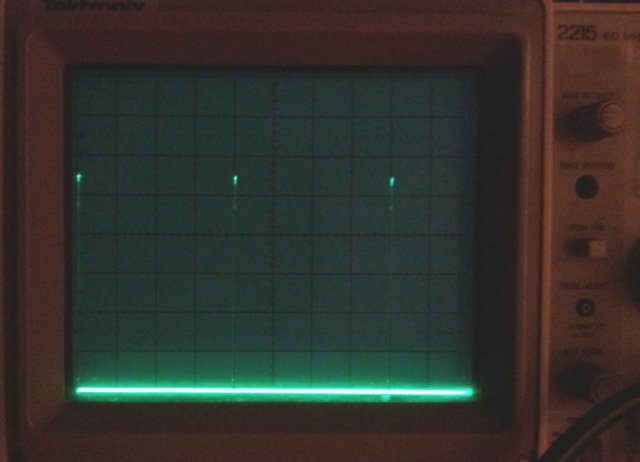 These pulses aren’t quite long, so it is one of the few occasions where a scope more advanced than the 2215 Tektronix is really useful in the home shop… same pulses on a HP/Agilent/Keysight 54720A, 54713B plug-in, and 100 MHz 1:10 probe. 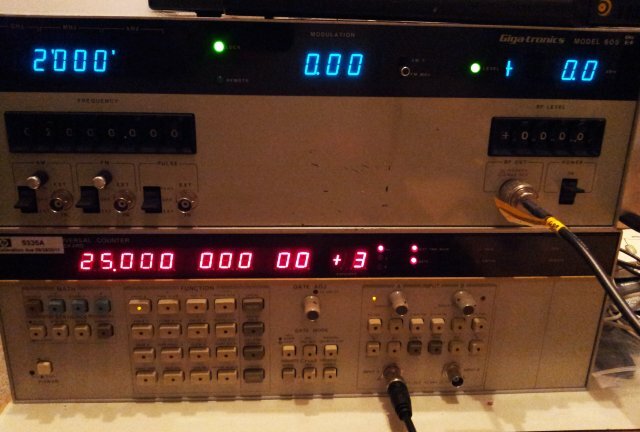 These fast risetime pulses, and the various prescalers, dividers and good input sensitivity make the ADF41020 quite useful for any PLL and frequency counting applications. 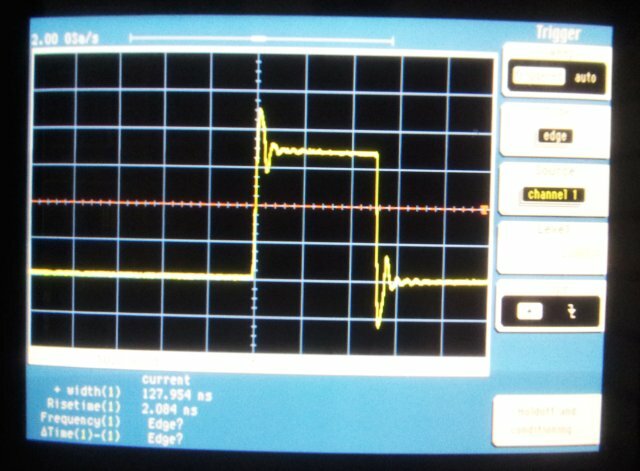 2 GHz in, 25 kHz out — confirmed. 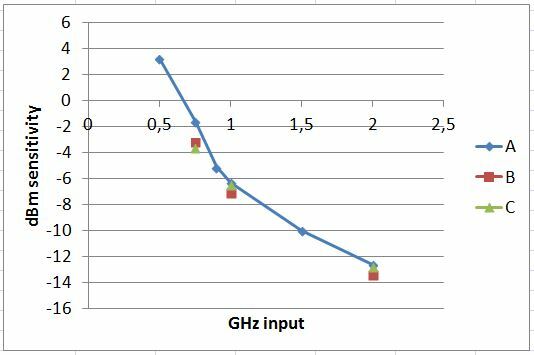 About the input sensitivity: the ADF41020 is specified over a 4 to 18 GHz range – how about lower frequencies? 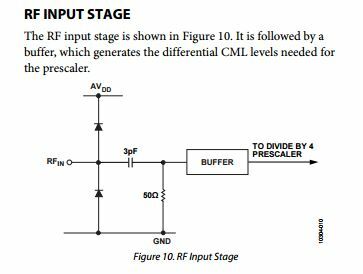 A quick look at the input circuit shows a 3 pF capacitor – which equals a reactance of about 53 Ohms, at 1 GHz (i.e., the capacitor and termination resistor will cut the input power available to the buffer approximately in half). … quite useful down to 1 GHz, no problem or instability at all. Also checked the the reproducibility, for 3 devices – not a lot of scatter.